You won't find classier pineapple decorations like these lovely glass pineapples. Pineapples have traditionally been a symbol of friendship, and hospitality.Use them as part of a centerpiece and later allow guests to take one home. 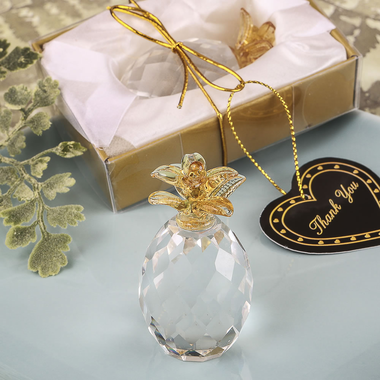 Measuring 2 1/8" x 1 1/8", each pineapple has an intricately faceted clear glass bottom and beautiful gold stalk on top. Each pineapple is also packaged in a matte gold bottom box with a white satin bed. The box is wrapped with a gold metallic ribbon wrap and bow with an attached thank you tag.